So, those of you that have stuck with me for the past year or longer will know that last February I pushed myself right out of my comfort zone and went to my first blogger event, which just happened to be at the London Edge alternative fashion show (read all about it here). It was a scary thing to do, as I’m by nature a pretty classic introvert, but it was such a good day that when I was thinking of my ‘experience’ (yep, still going on about those) for this month, this was the obvious choice for me. What I loved about last year was getting to see all the new repro ranges for spring and summer – my favourite seasons hands down – in some cases before the brands had even released their lookbooks. The other thing that was great about last year was the company, but unfortunately Porcelina couldn’t make it again, but luckily for me my lovely friend could. So, I had a photographer (get me) and the moral support needed to be brave and put myself out there again – and off we went. You all know I’m going to start with my first repro love, Collectif. Their stand was again humongous and absolutely packed full of not only SS16 pieces, but also AW16. It took me a while – and speaking to their lovely marketing lady – to realise AW was there too, which was a first for them. I already knew you could expect absolutely oodles more of what they do best for the warmer months as I’d seen their product preview shots already, but it was amazing seeing all the bright and pastel coloured clothes together. The staff on the stand were all wearing a gorgeous mint green cardigan with strawberry embroidery on that I already had my eye on – mint green and strawberries? Oh Collectif, how did you know? And you heard it hear first, ladies… the strawberry wicker bag is going to return! It will be joined by the adorable flamingo bag you can see in the photo. The Bright & Beautiful range is also going to explode with new goodies over the coming months; I’m really impressed with how rapidly this range is expanding – and such unique pieces too. Oh and if you want to see my full outfit, here I am standing right next to the Collectif / Bright & Beautiful stand, in a Collectif skirt – what else?). Another summer range I can’t wait to launch is Voodoo Vixen‘s. I actually didn’t spend a lot of time on this stand, but did look it over to try to hunt down the pieces I’d seen in their previews. Disappointingly, the ones I particularly had my eye on I didn’t see – I might have just missed them, mind you. But, you’ve got to love that pineapple print and adorable lemon bag! I love seahorses too, so I was a big fan of their new cardigan. If you haven’t seen the previews yet, do check out Facebook – it will be worth your time. It’s at this point that I should mention that I didn’t visit every single stand, as my friend and I wanted to get home at a decent time, it being a Sunday an’ all and she living a 2+ hour train-ride home. So my coverage is by no means extensive! However, I can tell you that you should watch out for Banned‘s Dancing Days range, which I caught some glimpses of on the catwalk. Another one of my favourites that we spent a lot of time browsing was Victory Parade. I loved their amazing range of prints last year and this year they had many of the same PLUS loads more unique designs. You really can’t beat this brand for patterns; they have virtually anything you can dream of. I learned while on this stand that their products are made to order in Manchester, which explains why they’re quite pricey compared to other repro. They’re also a pretty small operation, which probably likewise explains why you don’t see them working with bloggers all that much. I learned – with total dismay – that the chocolate pattern I’ve set my heart on (see pic in last year’s post) is about to run out. I couldn’t bear to miss it… So if you follow my Instagram or Facebook page, you’ll know how that story ended (hint: not with me being rich). Anyway, my friend fell head over heels for this adorable bunny and mushroom print. Special mention as well for Dolly & Dotty, whose stand was small, but so packed with goodies it was hard to see everything. So many prints! I also fell for the majority of Banned‘s bag range too, but particularly this charming heart-shaped wicker bag. Which some of you might think looks am awful lot like Voodoo Vixen’s recent design and I think that’s true, but I always prefer white accents to black for wicker (and summer generally), so Banned won the battle of the heart-shaped wicker bags, for me. Moving on from bags, we come to jewellery and a lovely chat was had on the Bow and Crossbones stand with (frankly gorgeous) owner, Cam. I learned that her company has now been going for ten years and is just her and her husband, which is seriously impressive to me as BOY does she have a huge range! So much sparkly fakelite… So many colours and shapes… and, also, seahorses! How did everyone know I love seahorses? I hope to up my jewellery game even more this year and I think Bow and Crossbones are going to be one of my top choices for range and affordability. And finally, although as I say by no means extensively, we have Erstwilder‘s stand. So many brooches it was impossible to even work out how many different styles were there. A lot, is all I know. And don’t they look so impressive when put together like this? 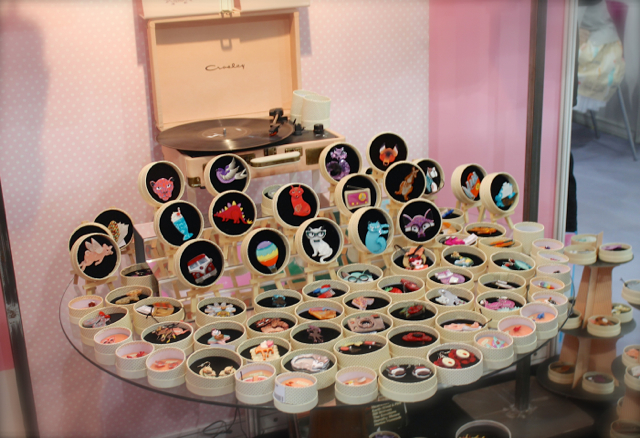 The stall owner (who I knew to be a distributor, not Erstwilder themselves), looked a bit confused about the brooch I was sporting that day being, as it is, from a batch that hasn’t released in the UK yet. She’s so cute though, and she matched my skirt, so I felt it only fair to introduce her to her brooch sisters and brothers. 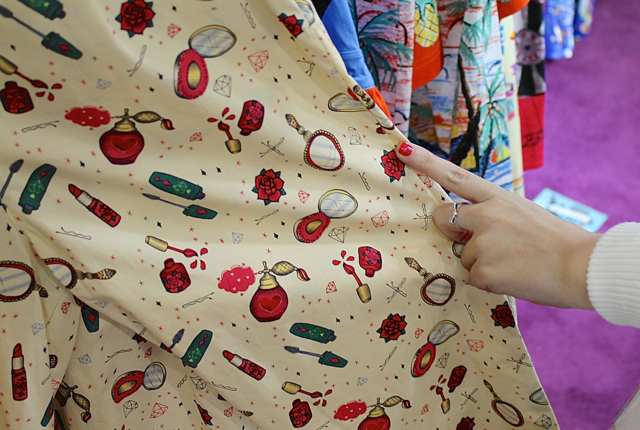 I could happily wear pretty much all of them… But if I have to pick favourites of the designs that are releasing in the near future, it is by miles the brand new Pin-up Picnic range, which my brooch is from (and in fact shares the same name). If you love Erstwilder and you love food, you are not going to be disappointed. So there we go, these are the highlights from my day. Anything here take your fancy…? And if you went, what did I miss?! Must have been a fun day out! Liking the look of some of the bags and that seahorse cardigan is marvellous! So glad you've done this post, I didn't end up making it myself as I was so ill! Although it's probibilly good for my pocket that I didn't! It's not been remotely good for mine that I did go… I'm daily searching for that Hell Bunny bag and constantly on the New In page on Collectif's website!! I love seeing all these new things coming out. It makes me excited but apprehensive for my pocket book! I love the flamingo bag from Collective, I'm happy to see so many wicker bags from Banned, and I adore those cardigans from Voodoo Vixen (I'm hoping the creamed colored cardigan will also be part of their line). I love seeing all those accessories from Bows and Crossbones! Checking out their website now. I can't wait for all those pretty dresses, clothes, and accessories to start hitting the shops! <3 Thanks CiCi for checking all this out for us! There seems to be lots of wicker bags around this year – I guess they were so popular for so many brands last year they would have been foolish not to meet demand. I think that cream cardigan is part of Voodoo Vixen's new line, yes 🙂 Glad to bring your attention to Bow and Crossbones – really cute accessories at great prices and they have such lovely things coming out all the time. I really like Victory Parade's pieces. Voodoo Vixen don't do the stuff I like from their ranges in my size, though they do have some lovely pieces. It looks like you had a brilliant day. I am absolutely in love with the Lulu Hun shoes! It's funny because I find that vintage inspired footwear doesn't seem to last as long as regular shoes and those look like great quality. I'm interested in giving them a try! nice highlights! Your outfit is so Stylish ! the last photo is very lovely…Your eyes are shining such charisma! I know, I'm sorry! I don't think they wanted us to share shots of that stuff though (I guess copying is a problem? ), so I was quite careful there. I basically haven't slept since I went, keep thinking about that damn mint green bag. Looks like a great day! Lots of pretty things to be looking out for soon. I've not been to London edge before, I wouldn't enjoy it alone, not that I'm shy, but pretty boring without a partner in crime to gush over the new styles with. The lulu Hun shoes are now on my wish list! I really like the Victory Parade line. I just checked out their website, they've got some gorgeous designs. It sounds like there were tons of gorgeous pieces, I would love to attend an event like that. They have absolutely stunning patterns – I genuinely believe no other repro brand out-does them for variety and design when it comes to their prints. Their stuff is pricey, but I can confirm you get what you pay for, it's lovely quality. The shipping costs are a bit steep even for the UK though! I've been meaning to go to this for the last 2 years, but it always falls on a weekend when I have something else on! Next year for sure! The autumn one did for me – but I never seem to have a lot on in February… If you do make it let me know as if I'm going we could say hi!